Sprint's long-running free for a year unlimited data plan offer has finally ended. The offer was first made available in June of 2017. It gave customer's a plan that included unlimited talk, text, and LTE data free for a year minus taxes. The offer officially ended on April 4, 2019, and representatives from the wireless carrier have informed BestMVNO that it is "gone for good." Sprint has not replaced the offer with anything in particular. 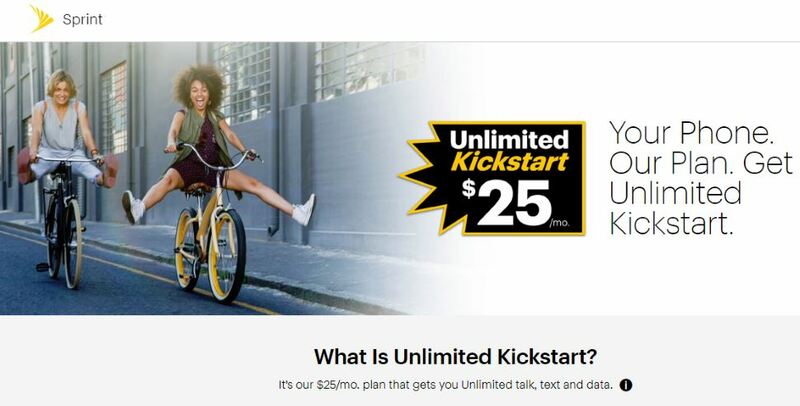 However, the carrier's $25/month Unlimited Kickstart plan is still available. To refresh, that gives subscribers unlimited talk, text and LTE data for $25/month. The plan does come with a few restrictions. It does not include any mobile hotspot and video streams are limited to a maximum resolution of 480p, gaming streams are limited to 2Mbps, and music streams are limited to 500Kbps. The plan is only available to customers who bring their own phone to the network or buy one from Sprint. Those who want to take advantage of one of Sprint's lease offers cannot subscribe to this plan, they will need to subscribe to an unlimited plan priced $60 or higher for a single line. Get a Samsung Galaxy S9 for $10/month on a Sprint Flex 18-month lease. Normally priced at $25/month. Offer scheduled to be available until 7/18/19. Get the LG G8 for $15/month on a Sprint Flex 18-month lease. Scheduled to be available until 4/11/19. Lease an iPhone XR for $15/month. Scheduled to be available until 5/16/19. Lease an LG V40 ThinQ for $15/month. Regularly priced at $30/month. Offer extended until 7/18/19. Samsung Galaxy S10 leases are still available and scheduled to last until 7/18/19. Leases start at $15/month. Switch to Sprint and lease the iPhone Xs or Xs Max starting at $41.67/month and get a $150 Prepaid MasterCard. Offers valid until 4/26/19. Switch to Sprint and buy a pre-owned 32GB iPhone 7 for $249.99 or a pre-owned iPhone 7 Plus for $288 and get a $100 Prepaid MasterCard. Offers valid until 7/18/19. I just read in the Sprint Sub Reddit that Boost Mobile has unlimited data for $25 a Month similar to Sprint $25 unlimited Kickstarter plan except they give you 12 GB of Mobile Hotspot data too. Plus it would probably be easier to sign up for this plan with Boost Mobile using a Boost Mobile prepaid phone as you wouldn’t need to have Sprint create a ticket to Re-Sku it for Sprint. It may have been extended until January to match the Boost Mobile Best Buy offer also referenced in the article.